Happy Monday, my wonderful readers! 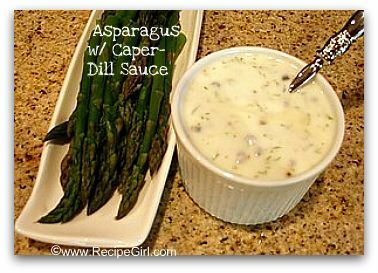 I have yet another special guest posting today while I power out three more days of writing my cookbook. Almost done, phew! 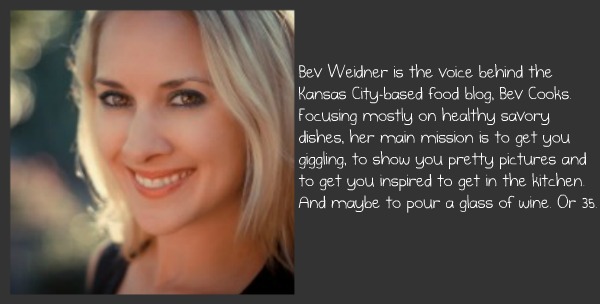 Please welcome Bev Weidner of the fabulous blog Bev Cooks. Bev is hugely talented (she posts regularly over on The Pioneer Woman‘s Tasty Kitchen site), and she makes me laugh… like constantly. 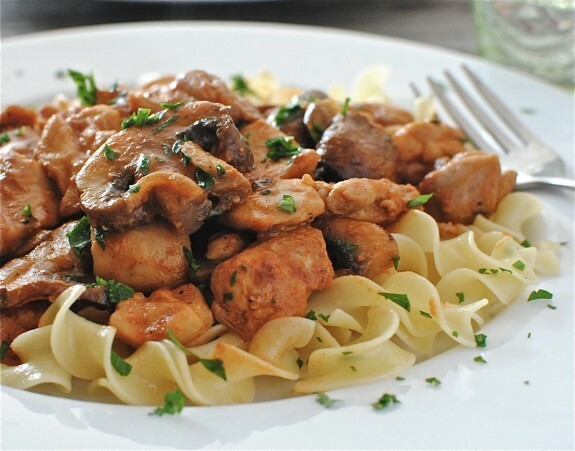 Bev is sharing her fabulous (healthy-version) of Chicken Stroganoff with us today. Well, hello! I’m Bev, of the blog Bev Cooks. I’m so excited to be over here on Lori’s super stylish corner of the web! I have yet to meet Lori, but this summer we have big plans. HUGE plans, you guys. Plans so big I’m nervous to even utter a slice of a mention of a thought about them. But I can tell you this. When we meet this June in Seattle, she’s going to whisper one of her super secret top shelf recipes from her new cookbook into my eardrum. And I will stand there, and I will tremble, and I will absorb every word. But I did ask her not to give me a wet Willy because, come on. That’s just sick. Ya just.dunt.knuh. how easy this is to pull together. Slice up some chicken thighs and dredge them in some mother-loving sweet paprika and a smidge of flour. 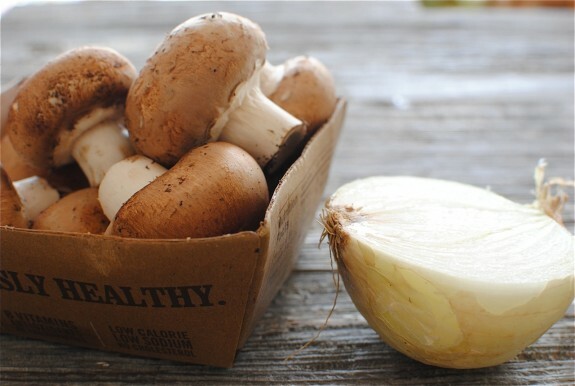 Get your mushrooms and onions sliced up all nice like. Boil your egg noodles. I’m sorry but egg noodles remind me so much of the late 80s. Things were so much better back then. I’m looking at you, Electric Youth perfume. I have no idea what any of that meant. And I mean it. The flavors in this? BOOM. It has everything you could ever need in this life of ours. Especially if you took a swig or 17 of that vermouth when you were deglazing, hey-ohhhh! Thanks so much for having me, Lori! You. . .still plan on meeting me, right? Hello???? Of course I still can’t wait to meet you in real life, Bev! 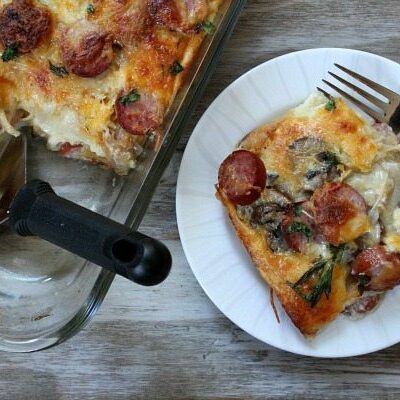 Y’all can visit Bev on Twitter, Facebook and Pinterest, and on her fabulous blog Bev Cooks. 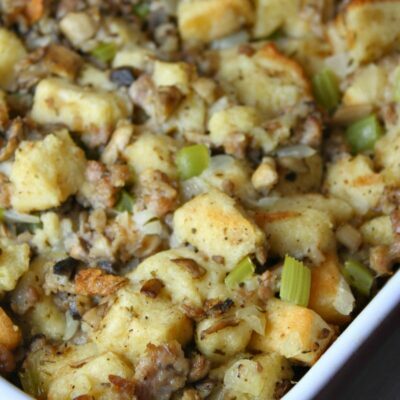 Thanks so MUCH Bev for sharing your fabulous recipe with us! 1. 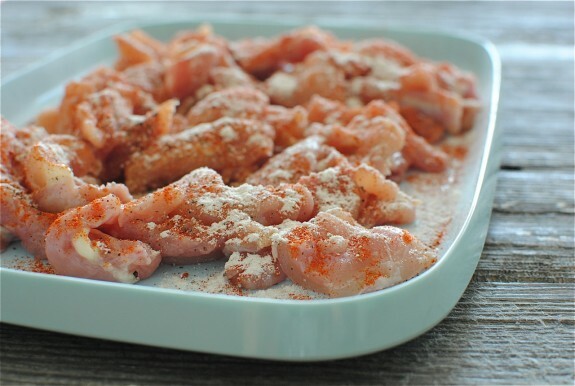 Toss the chicken with the paprika and a good pinch of salt and pepper. Dust it with flour. 2. 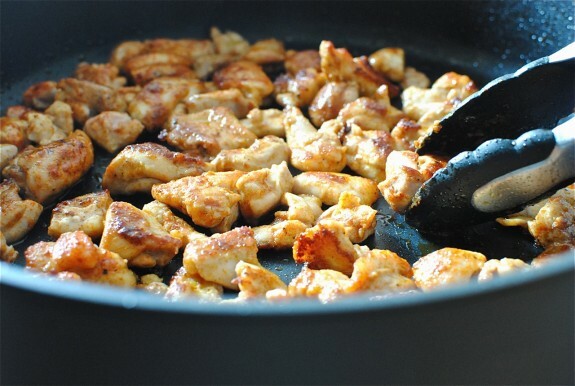 Heat a medium skillet over medium-high heat- spray with nonstick spray (or add 1 tablespoon olive oil). Add the chicken and sear until browned on all sides, about 7 minutes total. Remove from pan and set aside. 3. 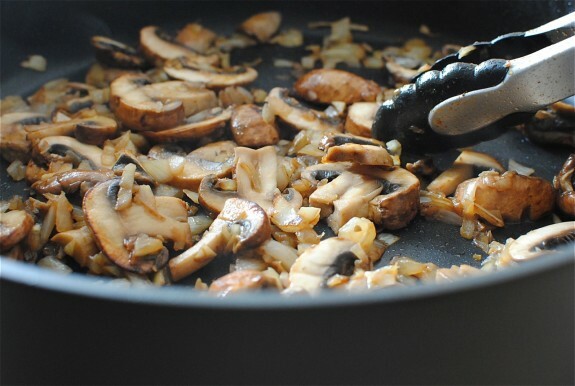 Add a smidge more oil to the pan if needed, then toss in the onions and mushrooms. Saute until everything starts to brown and caramelize, 5 minutes. 4. 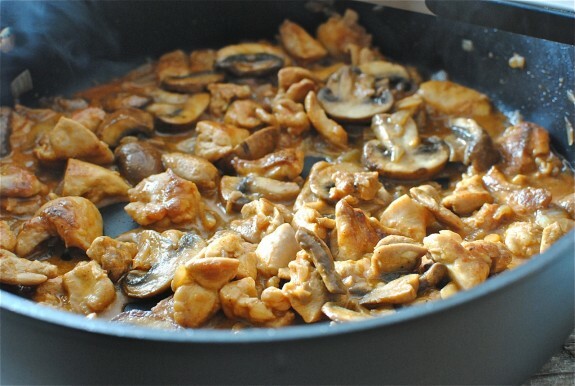 Deglaze the pan with the vermouth and let it sizzle about 1 minute. 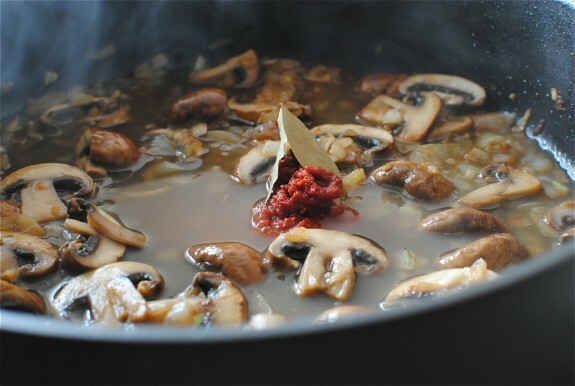 Add the stock, tomato paste and bay leaves. Stir to combine. 5. 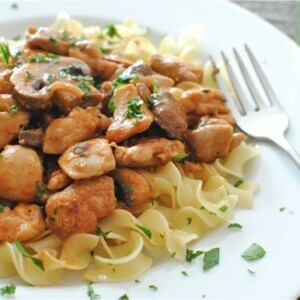 Nestle the chicken back in the pan (with its collected juices) and simmer until the chicken is cooked through and the sauce thickens a tad, 5 to 7 minutes. Stir in the yogurt and cook 2 more minutes. Give the whole mess a good pinch of salt and pepper. 6. 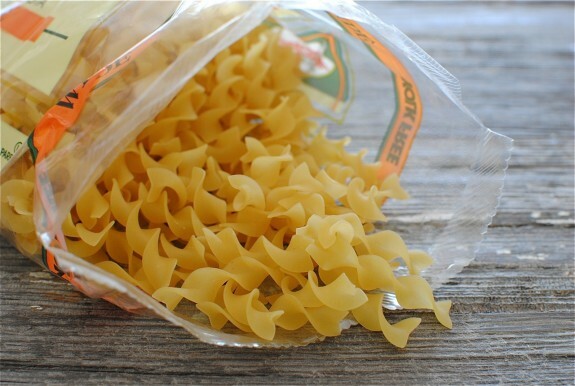 In the meantime, boil your egg noodles until they reach al dente (with still a bit of a bite to them). Drain. 7. 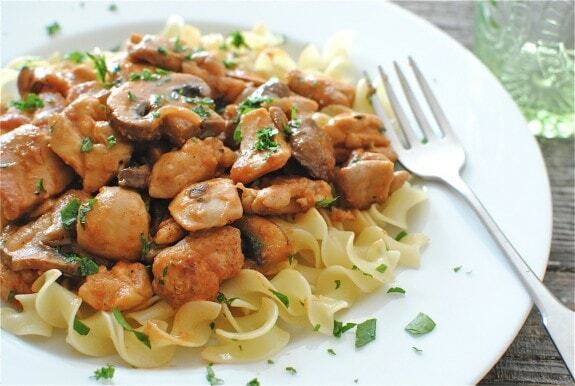 Serve the stroganoff over a bed of noodles and garnish with parsley. I made this with pork chops (diced and treated just like chicken), used extra chicken broth for the vermouth and it was quite good. 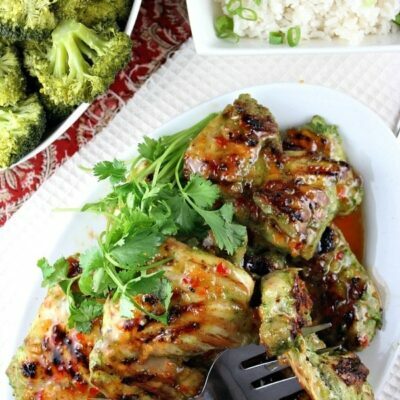 Thanks for a new dinnerr idea! Sounds wonderful – am assuming you mean French vermouth. I always have a bottle on hand for cooking. I made this for my family last night and they loved it! The kids kept telling me to make it again. Thanks for the recipe. I fixed this for supper tonight and I changed a few things. Instead of yogurt I used light sour cream. I also used some wine that I had in the fridge. 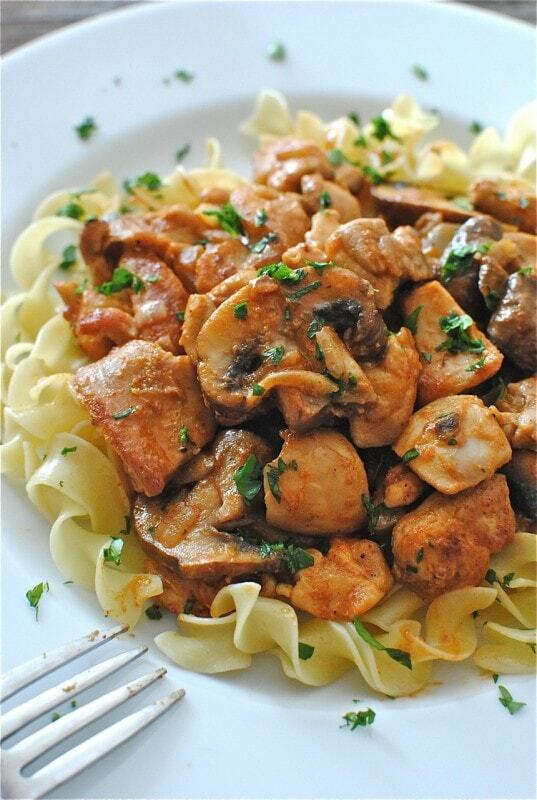 My husband said that what would be better for it would be to shred the chicken to soak up more of the flavors.